In 1938, Project P.1065 was presented to the German high command in response to a request for concept to utilize a new type of engine - the turbojet. Three prototypes were ordered in 1940, but these were ready well before the engines, so the airframes were test-flown with piston engines. By 1942, the Jumos were ready for flight and the Me 262 took to the air for the first time under jet power. By the time the aircraft had entered production and initial quantities were available for operations, there was only ten months left in the war. To delay matters further, Hitler himself protected many US bomber crews by demanding that these aircraft be used as high-speed bombers, despite Willy Messerschmitt, Adolf Galland, and others pleading to the contrary. Thanks Adolf! Adolf Galland was allocated some Me 262s for air defense and these went to JV 44, which used the Me 262s to attack the daylight bombing and used Fw 190D-9s to protect the Me 262s from the allied fighters that waited for these jets to return home low on airspeed, altitude, fuel, and armament. So the question for the theorists (and the Luft 46 crowd) is this: what would have happened if the Air Ministry had pushed up the priorities on Jumo development and subsequent Me 262 production? What if these aircraft entered service in mid-1943 instead of the following year? Scary thought! 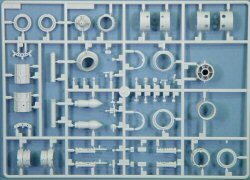 This kit has been eagerly anticipated since some of the sneak peeks at the IPMS/USA National Convention. 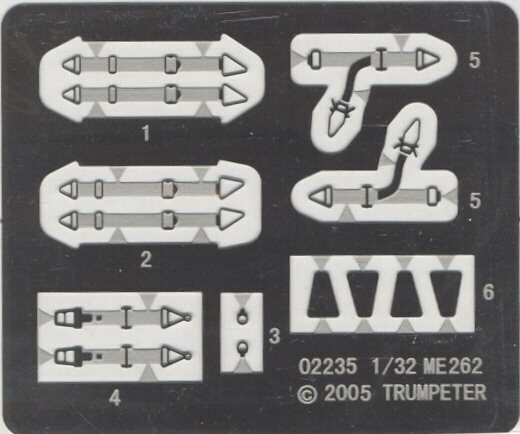 This is easily one of Trumpeter's best kits yet. 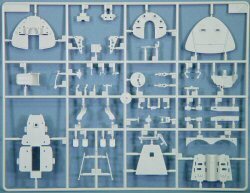 The kit is molded in the usual Trumpeter light gray styrene and presented on seven trees, plus a duplicate tree containing the nacelles molded clear, and two additional small parts trees containing the windscreen, canopy, instrument panel, gunsight, etc. The landing gear struts are cast in white metal (and nicely done at that!). Two nosegear struts are provided - one for a narrow tire and one for the wide nosegear tire. 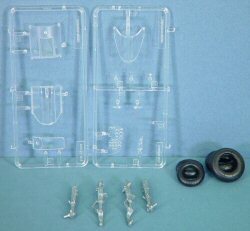 If you'd rather use styrene landing gear struts fear not, these are also provided. Four rubber tires are included, two mains, one narrow nosewheel and one wide nosewheel. 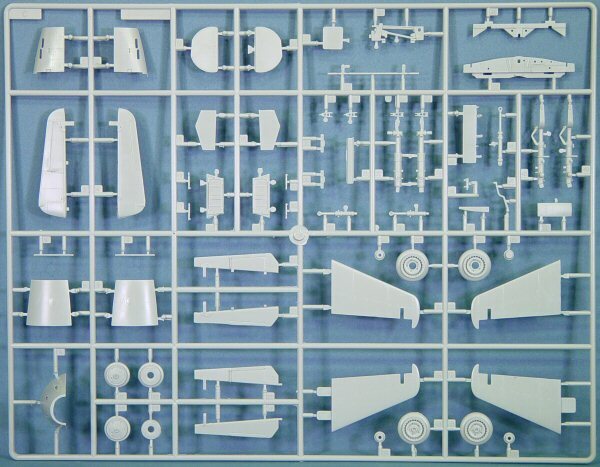 A small fret of photo-etched parts is included containing seat belts and shoulder harnesses. Look closely - NO photo-etched hinges for the flight control surfaces! Outstanding! 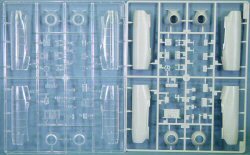 While I don't doubt that some enterprising aftermarket company will release a resin cockpit set for this kit, I wouldn't bother! This is the nicest cockpit tub I've seen for the Me 262 and actually one of the nicest I've seen from Trumpeter. The pilot's seat is nicely done, especially with the photo-etched harnesses, and this drops into a styrene tub with separate side consoles. The throttles, stick, rudder pedals, and other detailing are all present as separate parts. The kit also uses the same sandwiched acetate instrument faces behind the clear instrument panel. The rear of the instrument panel also has detailing when viewed from above and behind the panel. The gun bay is nicely laid out with the cannons, ammo feeds, and electrical junction boxes on the rear bulkhead. You might want to busy up that area a bit with some wiring as the bulkhead wall is a bit barren. 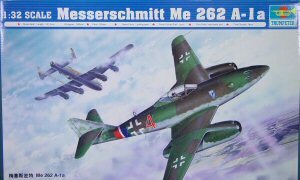 See our photo walk around of the Me 262 to see what I mean. The gun bay access doors can be positioned open or closed. The Jumo engines are very nicely detailed, though detailed engines are one of the areas that Trumpeter excels at. 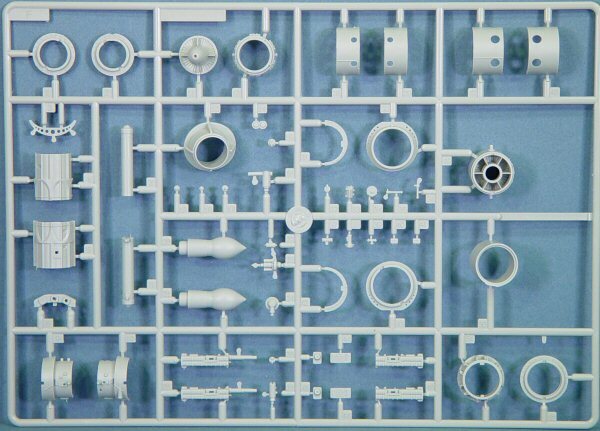 In this case, you can build and paint up your engines as you'll have the option of replacing one or more of the nacelle halves with clear parts to show off your work! 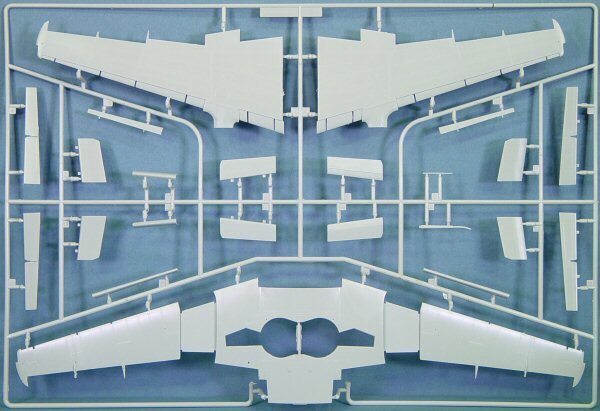 One of the other nice features of this kit is the separate flight control surfaces. The ailerons, rudder, elevators, leading edge slats, and trailing edge flaps are all separate parts that can be positioned however you like. The best part is that you can cement them into place and they'll stay there - no photo-etched hinges to contend with! The rear fuselage also receives some nice detailing that will be visible through a positionable access panel door in the right side of the fuselage behind the cockpit. The color profiles in the kit use Gunze Sangyo color numbers. While the exterior colors look fine, be a little skeptical of the interior colors. Look at your references. 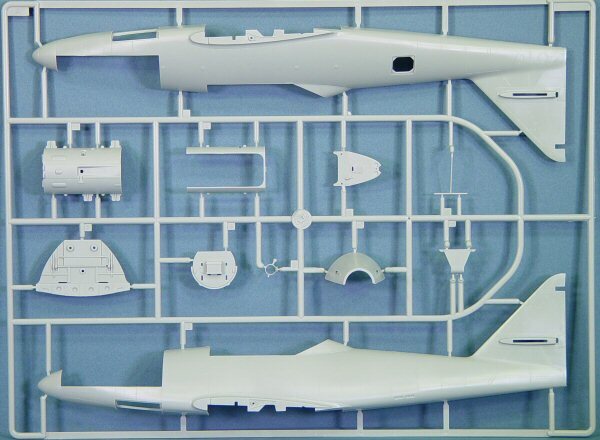 This is the nicest aircraft kit I've seen to date from Trumpeter. 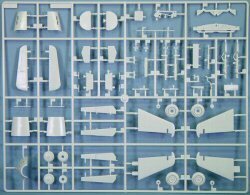 Don't get me wrong, the A-10, MiG-21, Su-27, etc., were all impressive and nicely done (who would have ever dreamed of a 1/32 F-105 in styrene in my lifetime?) 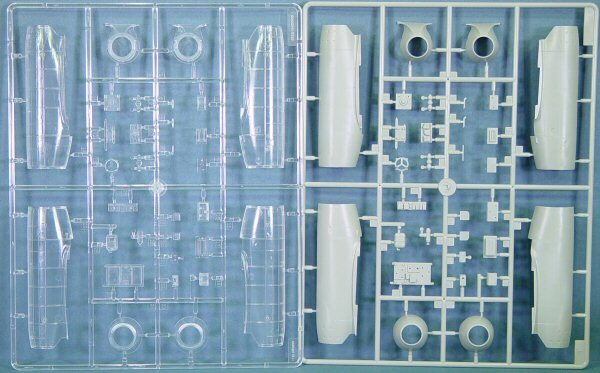 but the molding and molded-in detailing is getting better with each release. 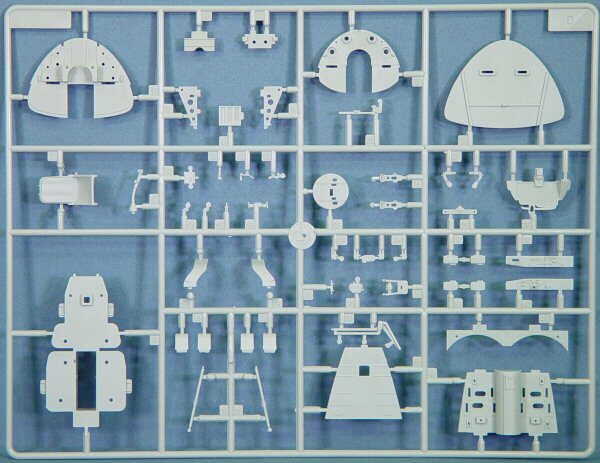 This kit easily beats any other Me 262 kit released in any scale. Highly recommended! 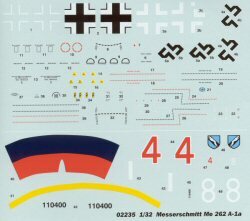 Don't forget, we'll be seeing the Me 262A-2a kit coming in the next month or so. That version differs from this with only two guns in the nose and provisions for bomb racks - Hitler's well-deserved high-speed bomber (can you say 'target'? ).